I knew from the minute I first tried Soy Curls that this recipe was coming. They are just PERFECT for an good old fashioned Texas Style BBQ Sandwich. The look, the feel, the texture, everything about them screams “pulled pork sandwich”. And with the addition of just the right BBQ sauce? 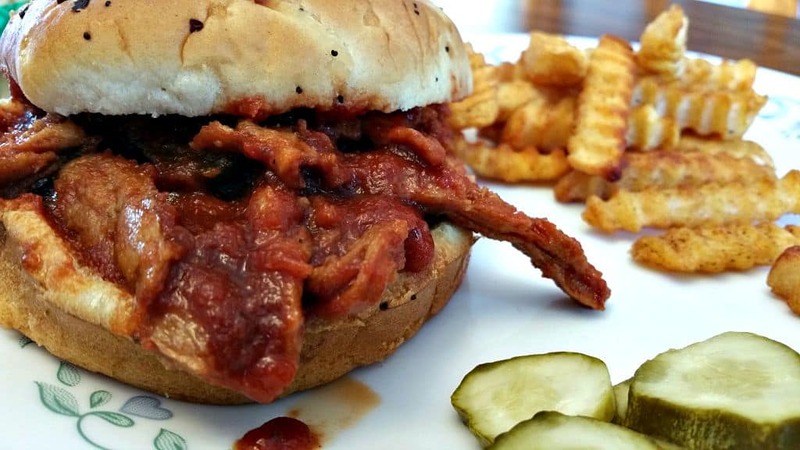 I first tried to imitate that classic Texas taste when I introduced my Texas Style Vegan BBQ Recipe back in March of 2015 using mushrooms instead of meat. They were definitely good, don’t get me wrong, but the texture was just a bit off. Close, but not quite right. When you bite into THIS sandwich you’d swear you were biting into the real deal. You know it’s a good BBQ joint when you can smell the smokehouse miles away. They have the picnic tables out front with a roll of paper towels on each one and all your meat comes served on a sheet of butcher’s paper. And the sauce, that sweet and spicy sauce that drips off your chin with each bite? With the jalapeños and pickles? Yeah this is almost like that. The plus side of THIS recipe is you can make it at home! It’s easy to make, fairly quick, and will satisfy that inner BBQ craving like nothing else. Ready to make some Texas BBQ? Let’s go! As the name implies, you’re going to need some Soy Curls. They are made from a company called Butler Foods right here in Oregon. I can tell you the only ingredient on the bag is soybeans and they are NON-GMO. So no extra chemicals, no weird ingredients, just dried shredded soybeans. However if you cannot have Soy, fear not, just click on my original recipe up above using Mushrooms. I found Butler Soy Curls at my local Whole Foods, so you may have to either shop around or ask your local grocers if they carry them. They are also available online either at their company website or at Amazon. I’ll provide a link if you’d like to purchase some however I do have to tell you that this will be an affiliate link, meaning with each purchase though Amazon I do receive a small compensation. It’s not much but it does help me keep this site running and by law I have to tell you. Ok, legalities aside, here’s the Amazon link to Butler Soy Curls or you can just click on the picture. The first thing you’re going to want to do is dump them into a large bowl and add hot water to cover them. Let these sit at least 10 minutes to rehydrate – just enough time to cook our sauce. For the sauce, add all your ingredients to a large saucepan. I do NOT have any onions in this sauce, but they would make a yummy addition. Feel free to add 1/2 cup or so of your favorite onions making sure they are finely diced first. I don’t use onions in any of my recipes anymore as my daughter suffers from Chron’s Disease, and onions are a major trigger. Now I DO use honey in this recipe, so if you have a problem with honey go ahead and try the sweetener of your choice – agave, maple syrup, whatever. I have never tried these variations so I don’t know how much they’ll change the flavor. As a Vegan, I personally have no problems using honey – as long as it’s local natural honey and NOT a major store brand made in some factory. I know where my honey comes from and it’s made right around the corner from me, all naturally and from local bees. I know there will be different opinions on this as honey is usually a controversial topic. Do what seems right for you. Now, slowly simmer your sauce, stirring occasionally, until it’s completely heated though and slightly thickens. Then drain your Soy Curls, squeezing out as much excess water as you can. Add the curls to the sauce and stir to combine. Let that simmer for a few minutes to let the curls soak up as much sauce as possible and then serve on the bun of your choice. Enjoy and Happy Labor Day everyone! 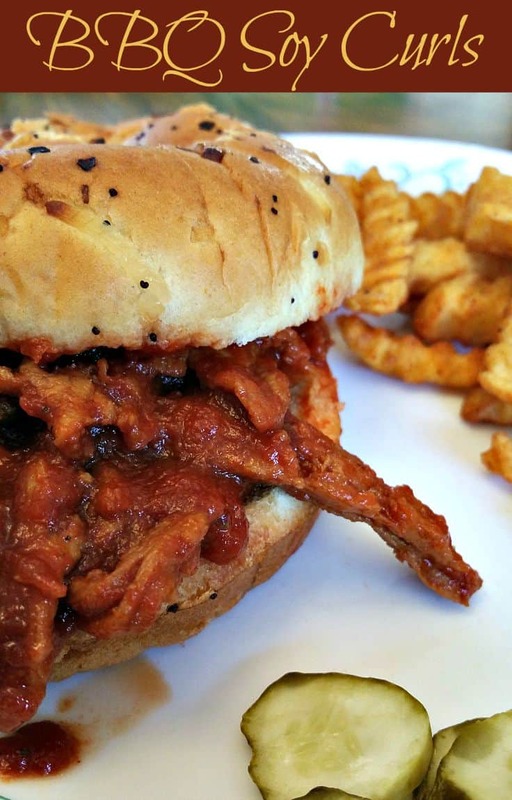 These BBQ Soy Curls make the perfect Rich and Juicy BBQ Sandwich. You'll swear you're sitting in a Texas Roadhouse! (Pass the napkins). Add remaining ingredients to large saucepan. Omg, this looks amazing!! And sounds so good! Living in Texas I’m always on the hunt for a good BBQ slider alternative and this may be it. On a side note, your affiliate link is broken and not clickable, at least through Chrome. I just thought I would let you know. Thanks! And thanks for the update on the link – it’s all fixed now. Hi Chuck, I’m sure you know but you can get Soy Curls by the case in Grand Ronde where they make them. Also their fantastic jerky! Hey Chuck, this looks very good. I’ll sub the honey with maple syrup. Thanks! I finally gave the Soy Curls a try… they have looked so good in your recipes.. and I must say to anyone who has waited… don’t wait any more. They are great! I found mine on Amazon. I am not a huge tofu fan at all or faux meat kinda person. But these were great! The texture is just right not not only are they good in this BBQ sandwich I will be trying them next in your enchilada recipe. Thanks! Great new addition to the menu in my household! Chuck, I’m trying soy curls for the first time and really like the idea of BBQ, but I don’t care for such a sweet sauce. Just as a point of reference, I don’t care so much for Sweet Baby Ray’s and prefer something more along the lines of Original Open Pit BBQ sauce. So I’m wondering, do you think your sauce would be good if I left out the molasses and honey? Or do you have another recommendation? What I would suggest is finding a BBQ Sauce that you like. Just be sure and check the ingredients. I don’t have a Carolina style sauce (yet) but I also bet you could find a good recipe online. If you want to try mine without the molasses and sweetener……go for it. Let me know how it turns out. Thanks for introducing me to Soy Curls! Our WF doesn’t carry them so thank goodness for Amazon. They make an amazing Mongolian Beef dish as well! I recently visited Portland, and was able to pick up some soy curls and Worcestershire sauce. I really enjoyed this recipe, making it pretty much exactly as is. I made a slaw to put on top, and had a great meal. I jarred up the leftover sauce to use another time. What is date syrup and what can I use as a substitute? I do not see the date syrup recipe and you talk all about honey, but none is listed in the recipe? This was the most amazing recipe, My daughter is vegitarian but after spending the last few days with me.cooking your wonderful recipies, BBQ soy curl, ,Chili and potato fries she is going to get rid of the dairy and oil and move forward on he journey of health. Thanks to you wonderful recipes! 8 oz package – the only size package I have seen at Whole Foods. Butler foods site is best place to order soy curls from. Even with shipping they are cheaper than from Amazon. Also, they should be kept in the refrigerator or freezer. By the way, when I order from Butler they include an item free to try. Last time it was soy curl jerky and taco seasoning!